My standard everyday method of making gravy is pretty lazy. I take some Bisto granules and add boiling water. That’s it. It’s not very special but it’s quick and easy with a good meaty taste. It’s also very easy to have the granules in the cupboard and they keep for ages. I was quite intrigued by the idea of frozen gravy. Obviously it’s another product with long life potential. So I bought some in the hope that it would prove both tasty and quick to make. 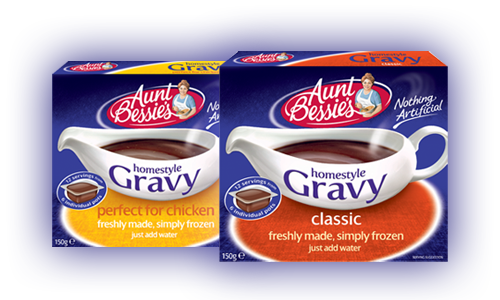 The gravy comes in two flavours, a meat one and a poultry one. It did indeed prove to be quick and easy to make. You pop the gravy ice cube in a jug and pour boiling water over. Then you stir it till it’s dissolved. Finally you put it in the microwave for a couple of minutes. One cube serves 2 people and the box contains 6 cubes. Of course the all important question is the taste. The gravy was a good consistency which could be easily altered with water to your preferred thickness. I had purchased the poultry flavour. It had a light herby taste which was very pleasant, however it was nowhere near as meaty as standard Bisto granules. It did however taste a lot more natural than Bisto and not as overpowering. I suspect it wasn’t as salty as Bisto either. The taste of the herbs coming through added a little something extra which you don’t get with straight gravy granules. There is also the option to make up the gravy with meat juices which would probably improve the meatiness. I will certainly be using up the rest of the box quite happily and may keep some in my freezer for convenience. However my husband preferred his meaty Bisto overall so we will probably stick to that as our quick and easy week night gravy.